How are the water retailers performing? Why have complaints in the non-household water retail market rocketed since competition was introduced? And what are retailers doing about it? 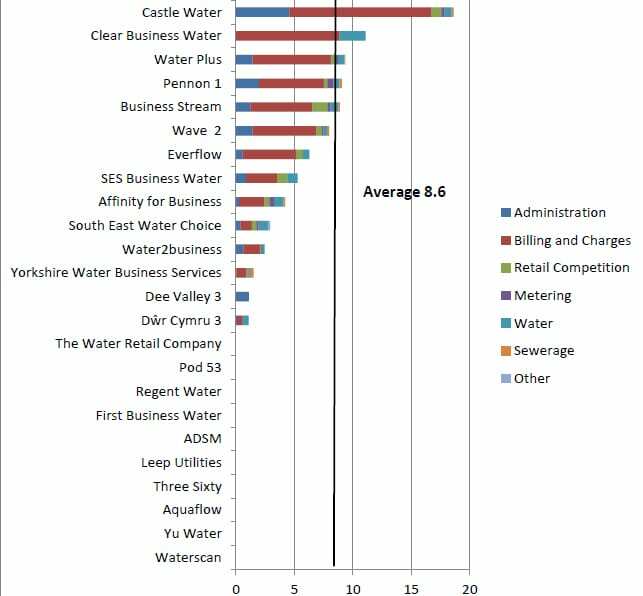 The Consumer Council for Water’s customer complaints league table for water retailers is in and the picture isn’t pretty. Complaints received by CCWater against retailers are up 237 per cent on the year, sparking a dire warning from the watchdog that retailers must “get their acts together”. Until last year, customers were not able to leave their water company. Since the non-household market opened in April 2017, business customers have had the option to switch. The market was supposed to drive improvements in customer service, as well as pushing down costs for customers, and encouraging innovation and water efficiency. However, as well as the shocking figures on complaints to CCWater against retailers, non-household written complaints received by companies between market opening and March 2018 are up 26.4 per cent on the previous year, at 14,885. What’s obvious from the report is that both increases were driven by a small number of poor performing retailers, namely Castle Water, Wave and Water Plus, who were responsible for a disproportionate share of the rise in complaints. What’s more, the report solely focusses on written complaints, which tell only a small part of the story. CCWater says non-household customers also had to make more than 46,500 telephone calls to resolve an issue with their supplier between January and March 2018. So, what’s causing this dramatic hike in complaints? Some retailers put it down to teething issues with both the central market data, and their own systems and processes. Castle Water chief executive John Reynolds tells Utility Week the problems hail from when customers affected by data inconsistencies in the central market operating system (CMOS) were first invoiced. He insists that since September 2017 the company has seen a “significant reduction” in complaints. “Castle Water has resolved these issues, and thousands of others – resolving 10-times as many errors in CMOS data as complaints received, giving substantial savings in water charges to customers. Castle Water’s continuing investment in customer service can be seen in the increasing proportion of 5* reviews on [online businesses review website] Trustpilot – these are now 50 per cent of all reviews,” he insists. CCWater registered the customer complaints under seven main categories: administration, billing and charges, retail competition, metering, water, sewerage and “other”. Most complaints (64 per cent) were about billing and charges, compared to 53 per cent the year before. The consumer group suggests some retailers appear to have “underestimated staffing requirements”, which has led to customers being unable to contact their retailer or get a timely response to a written complaint. “As a result, we received a high level of NHH [non-household] customer complaints about administration issues, like poor experiences in trying to deal with their retailer,” says the water watchdog. When a customer has exhausted a company’s complaint procedure and remains dissatisfied, CCWater has the statutory power to investigate that complaint – which it says is a serious intervention. The consumer watchdog investigated 28 complaints against retail companies in 2017/18, compared with just seven investigations for the whole industry in 2016/17. More than half (17) of its investigations were against Water Plus. Delays were “sometimes due to inefficient communication between the retailer and wholesaler” – a well-documented problem in the water retail market, and one which MOSL’s digital strategy committee is working on resolving. CCWater recorded 7 per cent of its NHH complaints against wholesalers where it felt they were the predominant company causing customer dissatisfaction. However, CCWater complaints are only a small subset of the market total, and retailers deemed 23.3 per cent of written complaints to be partly or fully a wholesale issue. It’s not all bad news. Most of the market’s retailers, CCWater claims, appear to have “adapted well” to competition and avoided many of the service problems encountered by the poorer performers. CCWater says it received no complaints about 10 retailers. Although the consumer group does point out that some of these retailers had very few or no SPIDs [supply points] at the time of its analysis, as they had received their licences near the end of the financial year. 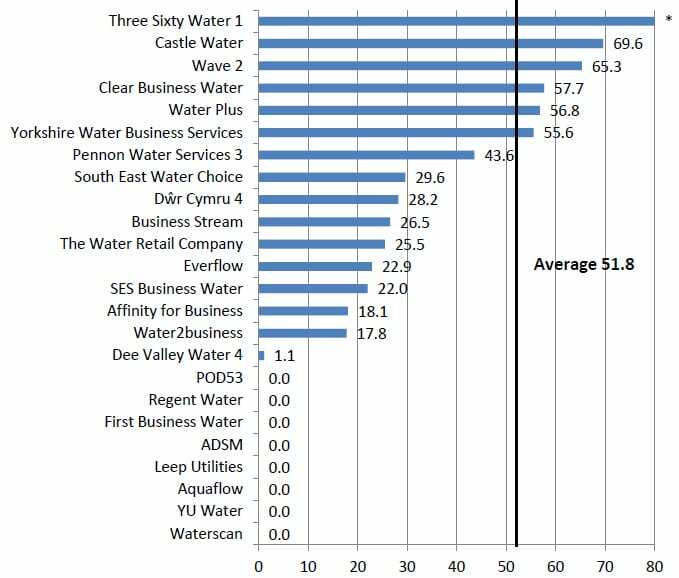 Among the best performers were SES Business, Water2business, Affinity for Business and Dee Valley Water, which is based in Wales where there is currently a limited competitive market. So, what now for the retailers? Water Plus’s Hughes says there is still a lot of work to do for all participants to make the market more effective for customers, and insists the company “continues its efforts” to improve processes that impact them. “Customers should start seeing the benefits of our investment in the next few months,” he adds. One thing is clear – the poorer performers must come into line with their better performing competitor, and fast, or they risk losing customers.